New, Sealed, Signed & Numbered Book. I found a picture of the signed bookplate online which I posted on the listing. Signed on Bookplate by Yoko Ono Lennon. In 1971, John Lennon & Yoko Ono conceived and recorded the critically acclaimed album. At their Georgian country home, Tittenhurst Park, in Berkshire, England, in the state-of-the-art studio they built in the grounds, and at the Record Plant in New York. The lyrics of the title track were inspired by Yoko Ono's "event scores" in her 1964 book. And she was officially co-credited as writer in June 2017. Tells the story of John & Yoko's life, work and relationship during this intensely creative period. It transports readers to home and working environments showcasing Yoko's closely guarded archive of photos and artifacts, using artfully compiled narrative film stills, and featuring digitally rendered maps, floor plans and panoramas that recreate the interiors in evocative detail. John & Yoko introduce each chapter and song; Yoko also provides invaluable additional commentary and a preface. All the minutiae is examined: the locations, the key players, the music and lyrics, the production techniques and the artworks - including the creative process behind the double exposure polaroids used on the album cover. With a message as universal and pertinent today as it was when the album was created, this landmark publication is a fitting tribute to John & Yoko and their place in cultural history. Limited to only 300 copies worldwide the extra-special Signed Collectors Edition includes, in addition to the expanded book and clothbound portfolio case, a bookplate signed by Yoko Ono and a hand-numbered, officially stamped giclee print. Hand-numbered bookplate signed by Yoko Ono. 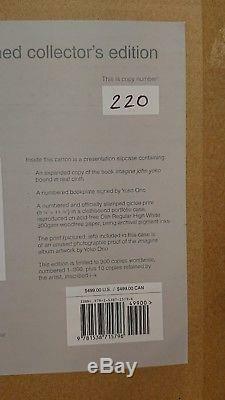 An expanded copy of IMAGINE JOHN YOKO, slipcased and bound in real cloth, with an additional 176 pages. Over 150 new illustrations, including more artworks from the This Is Not Here exhibition, further new insights and personal testimonies, an entirely new chapter devoted to the singles from the period, and six almost 1 metre-long gatefolds of panoramas stitched together from rare film outtakes. A clothbound portfolio case containing a hand-numbered and officially stamped giclee print reproduced on acid-free Olin Regular High White 300gsm woodfree paper, using archival pigment inks. 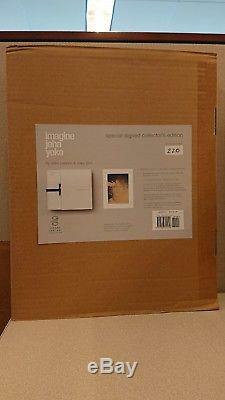 The print, exclusive to this edition, is of an unused photographic proof of the Imagine album artwork by Yoko Ono. Limited to 300 copies worldwide, plus 10 copies retained by the artist, inscribed i-x. TThe box hasn't not been opened. It has been sealed by the publishers. This is for number 220. The item "Imagine John Yoko Ono Lennon Collectors Signed Edition Numbered Book Deluxe Rare" is in sale since Saturday, November 17, 2018. This item is in the category "Books\Fiction & Literature". The seller is "romrom64" and is located in Rego Park, New York. This item can be shipped worldwide.